Allow me to introduce myself. I’m a former elementary school teacher who had no desire to homeschool. However, the six weeks my son with Autism Spectrum Disorder (ASD) spent in a regular preschool were the worst six weeks of our lives. He became a completely different child. Moving to a developmental delay preschool room helped, but when he started bringing home regressive behaviors, we decided it was time to pull him out and start homeschooling. I’m so thankful we did. Sometimes spectrum parents are afraid to pull their child from brick-and-mortar educational institutions. That is understandable. Let me share the benefits of homeschooling with you to help you make an informed decision. When you homeschool, you can create a calmer environment for your child. You can also incorporate sensory coping mechanisms, such as using a yoga ball instead of a desk chair, reading upside down, or studying while covered in blankets. For many ASD kids, the larger the class size, the greater the anxiety. This sounds obvious, but it does help. You can know what foods your child has eaten and can see if there are any reactions. Medical challenges can be watched constantly. When a child feels better, he/she can learn better. Life skills are a big part of homeschooling for children on the spectrum. Neurotypical people don’t realize how many steps it takes to accomplish what appears to be a simple task. Your ASD child doesn’t think of all of those steps. So, you get to teach him how to work through each step of taking a shower from beginning to end. She learns at home which adults are safe, how to introduce herself to a grownup helper, and how to ask for help. Then, she can practice her new skills at the museum you frequent. We can’t keep our kids away from all bullying since it happens in all places, not just school. But homeschooling drastically reduces the amount of peer pressure and bullying your child will experience. You can also walk him through interactions at the playground, for example, to help him learn when to stand up for himself and when to let things go. Is your child behind in reading or math? Does he have low muscle tone? The beauty of homeschooling is working at your child’s pace. If you need to spend more time on occupational therapy instead of academic work, or vice versa, that’s ok.
On the flip side, working at your child’s pace will improve his/her strengths. Does your daughter already know all her multiplication facts? Skip ahead! Is your son a zoology expert? Move on to a different science. When you teach your child at home, you have more freedom to incorporate activities that don’t work in a typical classroom with a group of children. You can do much more hands-on learning. Additionally, you can incorporate your child’s special interests into all content areas. Use Lego bricks to make models of body parts or illustrate historical events. Build an entire unit around airplanes or doll making, adding in math, science, history, reading, and writing. Most autism spectrum kids are not going to sit at a desk most of the day without issue. Teaching at home allows your child to work on the floor instead of sitting in a chair, to bury under a pile of blankets for sensory input while using a clipboard for a workspace, or to jump on a trampoline while reviewing math facts. You can take lessons outside and use sidewalk chalk or sticks in the mud. Homeschooling offers your child more success in social situations. That sounds counter-intuitive, right? Here’s why it’s true: your child can learn a new social skill with you at home. Then she can practice with siblings. Next she can practice with a neighbor or a librarian. Finally, she can use her skills in a larger group, at a library story time with other children, or on the playground. Starting small offers your child more success and less frustration. As you can see, homeschooling offers a variety of benefits for your child. A calmer, customized setting where your child can move faster or slower through material helps him/her succeed. 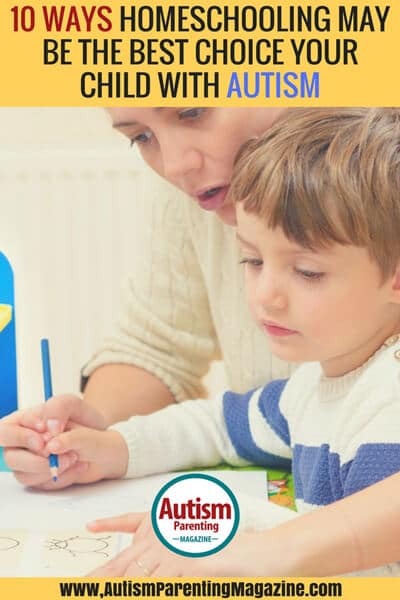 Practicing numerous skills at home in a safe environment boosts confidence and increases chances of success when out in the “real world.” May this list help you as you weigh the pros and cons of homeschooling for your family! My son is on the autism spectrum but is considered mild/high functioning. He is mainstreamed and not in special Ed as he does not qualify after his academic assessment. However, he has a challenging time in his large classrooms and is failing almost every class due to mostly sensory and anxiety issues.However, he does have an IEP. Can a child be homeschooled through the district and still have an IEP to help lower the amount workload (homework etc.)??? Our son started at a public school. They assessed him and developed an IEP. We recently realized he would be better off by home schooling. His IEP is still active through the charter school. And the IEP will stay with him until he much older. Even if we decided to let him go back to public school. It may depend on the district, Juanita. Definitely worth asking. My son is also mild/high functioning autistic who is 13 years old. He is in 7th grade and now struggles with the sensory and anxiety as well. We live in Iowa and are able to dual enroll. On a temporary trial we are able to have my son go to school for 4 classes and home school for the rest. Both my son and I love it. The website we use is time4learning.com which is just amazing. I highly recommend looking into the website. The biggest concern for me was not being able to teach him everything he needs academically but this website covers all his needs while I am able to work with him on his sensory, studying habits, anxiety and all the skills I realized he wasn’t getting from school. I’m sorry your son went through that, Luz. It sounds like you e been homeschooling him. I hope it continues to help him. Have you tried contacting a Charter School? Our son’s IEP transferred to the Charter school once we removed our son from a 27 child classroom environment. It was just too much activity for him. Anyway, his IEP is being honored and would even transfer back to the public system if we decided to let him go back to public school. The Charter school that he now attends is funded exactly like a public school, through the state. I wish you the best and truly hope that you find a Charter School, they will take his IEP. Yes, homeschooling is one of the best option. I could see my grandson improving so much with his mother helping him to learn things at his own pace within the comfort of a home. I would prefer special school. My son is also on the high function side and does not have Individual Education Plan as well. He is in main School and I just can not wait for September for year 7. This has been the worst year for him. There isn’t much help for aspergers kids. I’m sorry for your son’s difficulties, Janet. That seems to be common, unfortunately. I think my son would be in that category if he were in a school. I hope you find a situation that fits him well. Is homeschooling a good option for my 3 year olds child with autism? I think for three old your son special needs school is better. My son is currently going through and IEP that the school just doesn’t want to stick to. He comes home with horrible behaviors, always upset…Angry…crying ECT. He has ASD and anxiety, depression, developmental delay ECT. I am currently being advised to go and get an IEE and try to be approved. Also and independent evaluation. I am sorry to say I have had doctors tell me I am not qualified enough to homeschool my son because he has so many health issues. And I do not have a degree in special education. I am at my wit’s end with his school. He has been bullied for two years now and they act as if he’s fine. That’s all I hear..He’s doing great, wonderful job. Even though my son has said they make him cry everyday due to a color chart he’s very obsessed about. I am scared if he is taken out of school I will do more harm than good. But on the other hand I am also scared that if I go against the school they will retaliate on my son. What to do I keep asking myself. And I am writing to you to ask if you were in my boat what would you do? IEP, IEE Ido wish if people choose to use abreviations they would not assume the world will understand. Our son shows all the symtoms and characteristics of high function aspergers, not easy to get formal diagnosis where we live S.E.Asia but, my daughter works with young adults on the spectrum and she suggests that he would be defined as such. We chose to home school after he spent2 years at a private kindergarden which was somewhat of an ordeal. We took him to a different school for first year lessons where he had to undergo a test to gain entry, he scored 100% in each subject, english, maths, science and 99% in Thai language, we live in Thailand. He also speaks Laos, his grandmothers first language. All we have to do to continue home schooling is at the start of each term he takes a test at the local school to ensure that he is up to standard, he exceeds in all. Hi there I think your son case and my son case very close so please I needs more information from you if you able.am so glad your son get love those things.thanks!